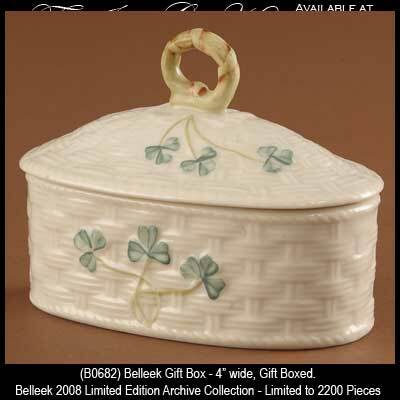 Belleek box is ideal for jewelry and features fine Irish china that is enhanced with hand painted shamrocks. Sorry, this box is now sold out. This archival collection Belleek box was re-introduced in 2008 for one year only. This Belleek jewelry box features hand painted shamrocks along with an embellished handle on the lid and an all over basket weave motif. The Belleek shamrock box is made of fine china and measures 4" wide x 3" tall. The Belleek China box is a limited edition of 2,200 pieces and it is suitable for trinkets and keepsakes. This Irish jewelry box is hand crafted in Belleek, Ireland and is gift boxed with a shamrock history card, complements of The Irish Gift House.